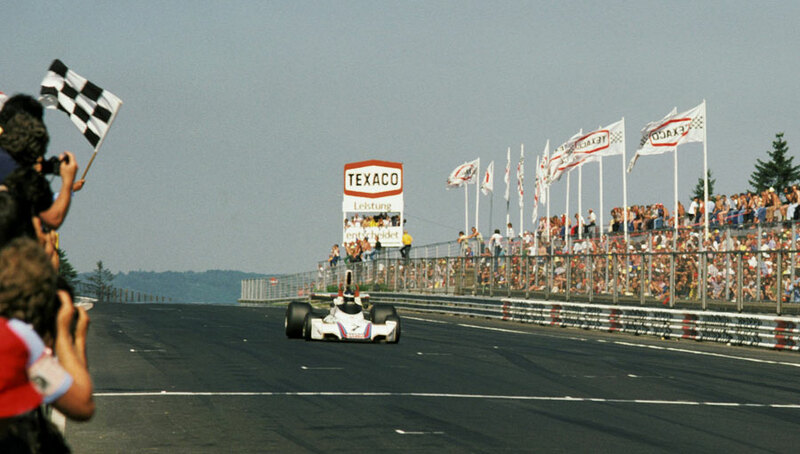 Carlos Reutemann won a German Grand Prix at the Nürburgring which was notable for the high attrition rate - only nine of the 24 starters finished - caused by a succession of punctures resulting from a failure to sweep flints and stones from the track. Championship leader Niki Lauda, who started on pole, led for ten of the 14 laps before being forced to pit with a deflating tyre. He rejoined the field in fourth, eventually gaining third when Tom Pryce, who had been as high as second, slipped back after his Shadow developed a leak and left him soaked in fuel. "I could smell petrol from about the halfway distance," he said. "Then it started to come under my helmet and burn my eyes. I felt as if I was going to be sick and nearly stopped." At one point he lost concentration and narrowly missed a steel barrier as he slid off. At the finish he was taken to hospital with burns to his right leg. Jody Scheckter, on the front row, made a terrible start but recovered from 15th to sixth before crashing on the tenth lap. Jochen Mass had a tyre explode and he crashed heavily while Mark Donohue's Penske suffered a similar fate, but he was able to limp to the pits for a new tyre. In contrast, Ronnie Peterson parked his March with clutch failure. Tony Brise crashed his Embassy for the second race running, plunging through a crash barrier at 130mph but escaping unhurt. Clay Regazzoni was second until his Ferrari suffered an engine failure, and Reutemann was able to capitalise on the retirements and mishaps in his Brabham having started tenth. James Hunt seemed well placed to take second before the drive shaft on his Hesketh failed, and so allowing Jacques Laffite to take second. Lella Lombardi finished seventh in her British-built March-Ford. With the announcement earlier in the week of the cancellation of the Canadian Grand Prix in September after teams failed to agree financial terms with organisers, Lauda's third place allowed him to increase his lead in the championship to 17 points with three races remaining, with Reutemann moving into second. The constructors' championship was a closer affair, with Ferrari a point ahead of Brabham.